4 Bedroom Detached House For Sale in Liverpool for Offers in the region of £325,000. Entwistle Green are pleased to introduce to the market this recently refurbished four bedroom detached property. This property offers a spacious entrance hallway, three good sized reception areas, large contemporary kitchen and dining room, separate utility with WC and separate ground floor cloakroom with integral access to the large single garage, purpose built workshop to the rear with access to patio. To the first floor there are four double bedrooms all offering the luxury of en-suite facilities and inbuilt wardrobe storage. 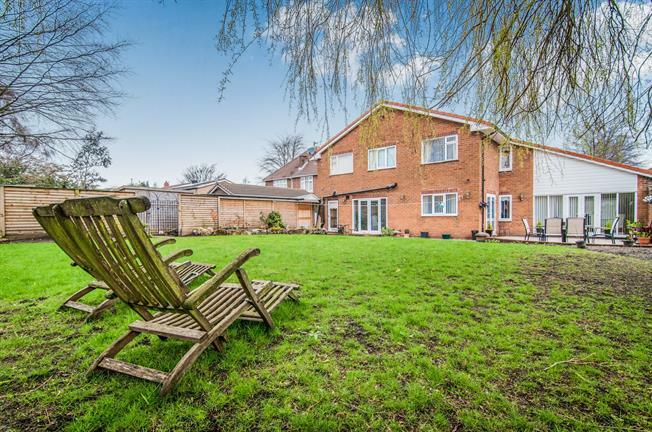 The property further benefits from large front and rear gardens ideal for multi-vehicle parking. The property has been refurbished boasting new contemporary bathroom and fitted kitchen suites, uPVC double glazed windows, a newly installed gas central heating system and re-wired throughout. There is the added benefit of no onward chain! Viewings are highly recommended this property must be seen to be fully appreciated, contact Entwistle Green on 0151 526 3432. Spacious hallway with porcelain tiled floor, radiator, storage cupboard, double doors to lounge. Laminate flooring, TV point, radiator, double glazed window. Laminate flooring, radiator, TV point, double glazed patio doors to patio. Laminate flooring, double glazed window and doors to external seating area, radiator. Range of floor and wall matching cupboards with work surfaces and splash back tiling, single sink with drainer, centre island with induction hob and breakfast bar, built in oven, fitted fridge freezer, porcelain tiled floor, integral dish washer, double glazed window to front and patio doors to the rear, radiator. Fitted cupboard, double glazed window, radiator, laminate floor. Fitted cupboards, boiler, heated towel rail, single sink and drainer, integral door to garage. Wash hand basin, bath, WC. Wash hand basin, WC, shower. Double doors opening onto the patio. Seated patio area, lawned garden.